RiseTime — Time it takes for the response to rise from 10% to 90% of the steady-state response. SettlingTime — Time it takes for the error |y(t) - yfinal| between the response y(t) and the steady-state response yfinal to fall to within 2% of yfinal. SettlingMin — Minimum value of y(t) once the response has risen. SettlingMax — Maximum value of y(t) once the response has risen. Overshoot — Percentage overshoot, relative to yfinal). PeakTime — Time at which the peak value occurs. The following figure illustrates some of these quantities on a typical second-order response. Using this syntax requires a Control System Toolbox™ license. S = stepinfo(y,t) computes step-response characteristics from an array of step-response data y and corresponding time vector t. For SISO system responses, y is a vector with the same number of entries as t. For MIMO response data, y is an array containing the responses of each I/O channel. This syntax uses the last value in y (or the last value in each channel's corresponding response data) as the steady-state value for computing characteristics that depend on that value. S = stepinfo(y,t,yfinal) computes step-response characteristics relative to the steady-state value yfinal. This syntax is useful when you know that the expected steady-state system response differs from the last value in y for reasons such as measurement noise. For SISO responses, t and y are vectors with the same length NS. For systems with NU inputs and NY outputs, you can specify y as an NS-by-NY-by-NU array (see step) and yfinal as an NY-by-NU array. stepinfo then returns a NY-by-NU structure array S of performance metrics for each I/O pair. S = stepinfo(___,'SettlingTimeThreshold',ST) lets you specify the threshold ST used in the definition of settling time. The response has settled when the error |y(t) - yfinal| becomes smaller than a fraction ST of its peak value. The default value is ST = 0.02 (2%). You can use this syntax with any of the previous input-argument combinations. S = stepinfo(___,'RiseTimeLimits',RT) lets you specify the lower and upper thresholds used in the definition of rise time. By default, the rise time is defined as the time the response takes to rise from 10 to 90% of the steady-state value (RT = [0.1 0.9]). The upper threshold RT(2) is also used to calculate SettlingMin and SettlingMax. These values are the minimum and maximum values of the response occurring after the response has reached the upper threshold. You can use this syntax with any of the previous input-argument combinations. Create the transfer function and examine its step response. The plot shows that the response rises in a few seconds, and then rings down to a steady-state value of about 2.5. Compute the characteristics of this response using stepinfo. By default, the settling time is the time it takes for y(t)-yfinal to fall below 2% of its peak value, where y(t)is the system response at time t and yfinal is the steady-state response. The result S.SettlingTime shows that for sys, this condition occurs after about 28 seconds. The default definition of rise time is the time it takes for the response to go from 10% of its steady-state value to 90% of that value. 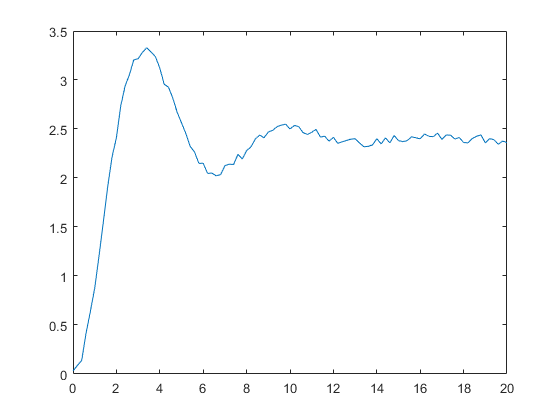 S.RiseTime shows that for sys, this rise occurs in less than 4 seconds. The maximum overshoot is returned in S.Overshoot. For this system, the peak value S.Peak, which occurs at the time S.PeakTime, overshoots the steady-state value by about 7.5% of the steady-state value. For a MIMO system, stepinfo returns a structure array in which each entry contains the response characteristics of the corresponding I/O channel of the system. For this example, use a two-output, two-input discrete-time system. Compute the step-response characteristics. Access the response characteristics for a particular I/0 channel by indexing into S. For instance, examine the response characteristics for the response from the first input to the second output of sys, corresponding to S(2,1). To access a particular value, use dot notation. For instance, extract the rise time of the (2,1) channel. Compute the time it takes for the error in the response of sys to to reach 0.5% of the steady-state response. To do so, set SettlingTimeThreshold to 0.5%, or 0.005. Compute the time it takes the response of sys to rise from 5% to 95% of the steady-state value. To do so, set RiseTimeThreshold to a vector containing those bounds. You can define both settling time and rise time in the same computation. 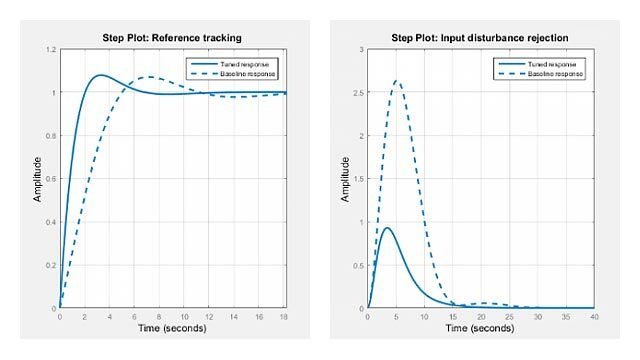 You can extract step-response characteristics from step-response data even if you do not have a model of your system. For instance, suppose you have measured the response of your system to a step input, and saved the resulting response data in a vector y of response values at the times stored in another vector, t. Load the response data and examine it. 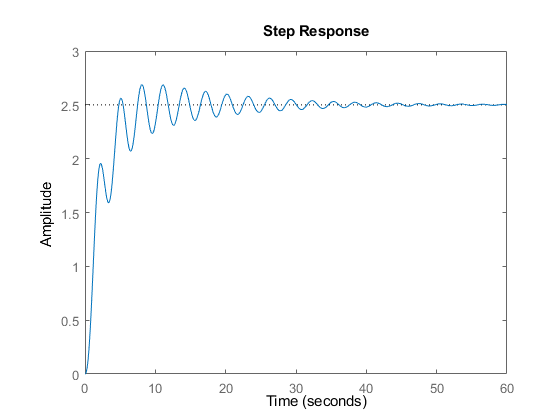 Compute step-response characteristics from this response data using stepinfo. If you do not specify the steady-state response value yfinal, then stepinfo assumes that the last value in the response vector y is the steady-state response.Because there is some noise in the data, the last value in y is likely not the true steady-state response value. When you know what the steady-state value should be, you can provide it to stepinfo. For this example, suppose that the steady-state response is 2.4. Because of the noise in the data, the default definition of the settling time is too stringent, resulting in an arbitrary value of almost 20 seconds. To allow for the noise, increase the settling-time threshold from the default 2% to 5%. Continuous-time or discrete-time numeric LTI models, such as tf, zpk, or ss models. Generalized or uncertain LTI models such as genss or uss models. (Using uncertain models requires Robust Control Toolbox™ software.) For generalized models, stepinfo computes the step-response characteristics using the current value of tunable blocks and the nominal value of uncertain blocks. For SISO response data, a vector of length Ns, where Ns is the number of samples in the response data. For MIMO response data, an Ns-by-Ny-by-Nu array, where Ny is the number of system outputs, and Nu is the number of system inputs. Time vector corresponding to the response data in y, specified as a vector of length Ns. For SISO response data, a scalar value. For MIMO response data, an Ny-by-Nu array, where each entry provides the steady-state response value for the corresponding system channel. If you do not provide yfinal, then stepinfo uses the last value in the corresponding channel of y as the steady-state response value. Threshold for defining settling time, specified as a scalar value between 0 and 1. By default, stepinfo defines settling time as the time it takes for the error |y(t) - yfinal| between the response y(t) and the steady-state response yfinal to fall to within 2% of yfinal. To change this definition, set ST to a different value. For instance, to set a threshold of 5%, set ST to 0.05. Threshold for defining rise time, specified as a 2-element row vector of nondescending values between 0 and 1. By default, stepinfo defines rise time as the time it takes for the response to rise from 10% to 90% of the steady-state value yfinal. To change this definition, set RT to a different value. For instance, to define the rise time as the time it takes for the response to rise from 5% to 95% of the steady-state value, set RT to [0.05 0.95]. For MIMO models or responses data, S is a structure array in which each entry contains the step-response characteristics of the corresponding I/O channel. For instance, if you provide a 3-input, 3-output model or array of response data, then S(2,3) contains the characteristics of the response from the third input to the second output. For an example, see Step-Response Characteristics of MIMO System. If sys is unstable, then all step-response characteristics are NaN, except for Peak and PeakTime, which are Inf.